Written by admin on June 13th, 2014 . After a long hiatus two of the pole people are in their rightful place. It took a long time for the two of them to get over the loss of their son Totem who mysterious dissapeared from the same spot many years ago. 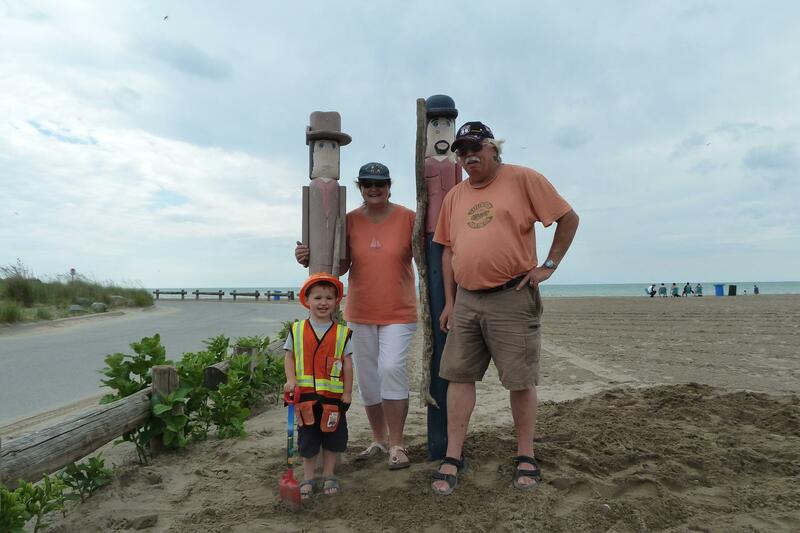 The pole people were created by Cathy Cook and were originally installed on the beach near Mackie’s in 2002 to celebrate the Elgin Hiking Trail being extended thru the village of Port Stanley. The pole people are at kilometre zero of the northward trek of the Trail that goes all the way to Southdel Bourne where it connects with the Thames Valley Trail. Seen in picture are Evan and his grand parents Loretta and Richard. Evan supervised the installation and enjoyed watching Mike from Central Elgin dig the hole with his back hoe. Thanks to Mike for making small work of the install.